Everything we do here at Presray is about safety and protection. Our products include a broad array of watertight and airtight flood doors and other containment and security solutions for critical facilities. 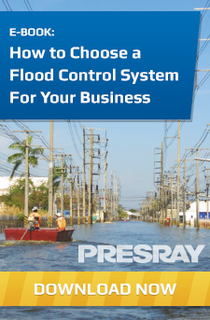 Presray's flood products exceed all government guidelines and rigorous, third-party FM Approvals® testing and certification. When aesthetics are critical, this flood barrier is invisible and instantly deploys with No Manpower.